Pedestrian versus auto accidents occur with unfortunate frequency in El Dorado Hills and in California in general. California ranked highest in the country for the number of pedestrian fatalities, according to the Los Angeles Times. Approximately 700 pedestrians passed away in motor vehicle incidents in California in the year 2014, according to findings from the Governors Highway Safety Association. Nationally, the data is not much better. According to the Centers for Disease Control and Prevention (CDC), over 5,000 pedestrians died in traffic collisions in 2015, and over 100,000 victims were treated at hospitals for injuries. If that was not bad enough, pedestrians were over 50 percent more likely to be killed in a collision than an accident involving two vehicles. In a pedestrian collision, extensive injuries can occur even where the offending vehicle was moving at a low speed. The simple reality is that as resilient as the human body can be, it cannot withstand the full force of impact from a vehicle weighing in excess of five thousand pounds. In some instances, the driver mistakenly believes that a pedestrian needs to yield to them. This is not accurate at all. In fact, according to California Vehicle Code § 21950, a driver of a vehicle is legally obligated to yield the right-of-way to someone who is attempting to cross a roadway within a designated crosswalk. Drivers also have a duty to exercise due care and must reduce their speed or take other necessary precautions to try and ensure they do not collide with the pedestrian. Basically, this means if you or a loved one was hit by a car while you were crossing at a designated crosswalk, the driver can probably be held liable for your harms and losses. Medical Bills From Being Hit by a Car can be Quite Large As mentioned, in roughly half the accidents where a car hits a pedestrian, the pedestrian dies. That does not mean the other half walks away unscathed. 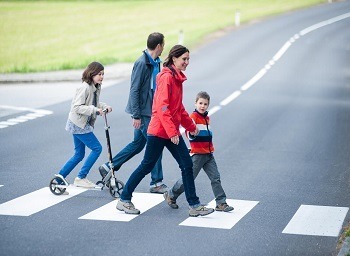 In fact, many pedestrians suffer serious, debilitating injuries such as fractured bones, a traumatic brain injury or related head trauma, paralysis, nerve damage, and loss of limbs. The treatment for these injuries can be quite expensive since you will likely require months of rehabilitative care, surgeries, medication, and so forth. Loss of Income and Earning Capacity: Permanent or temporary disability after an accident can result in you having to miss work. Sometimes you may be unable to return to your type of profession due to your pedestrian accident injuries. Pain and Suffering: Injuries from accidents hurt. Thankfully, California Law allows injured individuals to recover damages associated with the difficulty and hardship of surviving a pedestrian accident. Emotional Distress: Pedestrian versus car accidents can be very traumatic incidents. Sometimes people experience loss of sleep, psychiatric trauma and recurrent nightmares. Damages for emotional injuries can be obtained. Punitive Damages: In extreme pedestrian accident cases where an incident happened because of an intentional act or through gross negligence, it may even be possible to recover additional damages. Comparative Fault Standard Followed in California In some cases, liability is contested and the irresponsible driver points the finger back at you claiming you were also negligent. If you find yourself in this situation, do not worry. California adheres to a comparative negligence standard for personal injury cases. Basically, comparative negligence is a legal standard for assessing situations where there is evidence that both the plaintiff and defendant were partially at fault for the accident. California adheres to a “pure” comparative negligence standard. That means you can still obtain a financial recovery, even if a jury determines you were primarily at-fault for the accident. For example, if a jury determines that you were 90 percent at fault and the driver was 10 percent at fault, you can still obtain a financial recovery of 10 percent of your economic and non-economic damages. This is a much fairer standard than other jurisdictions that require a plaintiff be no more than 50 percent at fault in order to receive a financial recovery in a personal injury lawsuit. Time is of the Essence The sooner you contact an experienced El Dorado Hills pedestrian accident lawyer, the sooner a team of lawyers and investigators can get to work building your case. It is also important to speak to an attorney right away because, in California, an accident victim only has two years from the date of the accident to file a personal injury lawsuit in court. If you wait to file after two years, your case will likely be thrown out of court. El Dorado Hills Pedestrian Accident Lawyer I'm Ed Smith, an El Dorado Hills Pedestrian Accident Lawyer. If you or a member of your family has suffered a pedestrian injury, please give me a call at 916.921.6400 for free, friendly advice. I am a Million Dollar Advocate. Please take a moment to read some of my Past Settlements and Verdicts.